Students from Penryn College have helped raise over £2,000 for Cornwall Air Ambulance following their fantastic fundraising efforts during the school’s annual Charity Week. Heading into the Christmas break, pupils organised and hosted an assortment of money-raising activities for the life-saving charity, and the total fundraising amount has now reached an incredible £2,150. Students’ stalls lined the school corridors, brimming with a selection of homemade goods including cakes, jewellery, Christmas cards, Christmas decorations, and much more, while a student-teacher basketball game, fancy dress photo booth, and an end-of-term non-uniform day added to the fun-filled week of fundraising. Speaking following the latest update on the school’s fundraising total from the 2018 Charity Week, Amy Richards, New Heli Appeal Manager at Cornwall Air Ambulance, said: “A huge thank you to all of the students and teachers at Penryn College – they’ve raised a fantastic amount of money for our charity so far. As an extra incentive to increase the amount of money raised throughout the school’s Charity Week, a number of students and teachers dressed up in an assortment of Christmas-themed outfits for every £100 raised after the total reached £600 – much to the amusement of their fellow pupils and staff. 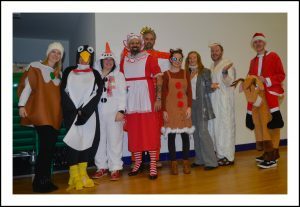 Dressing Up: Both staff and students got into the Christmas spirit as part of the school’s fundraising efforts. Year 11 Charity Prefects, Kate and Jasmine, helped organise a host of the activities and sales to help raise funds throughout the week, and reflected on the enjoyment that came from their involvement in fundraising. “Knowing the amount of money the school raised for Cornwall Air Ambulance gave me a real sense of achievement come the end of the week,” said Kate. “I especially enjoyed making the totaliser and designing the costumes for different members of the teaching staff. The charity totaliser was something the school had never done before, so it was really different and a lot of fun! It also encouraged us to raise as much money as possible and see the teachers dress up, which made the last day of term extra special,” she continued. 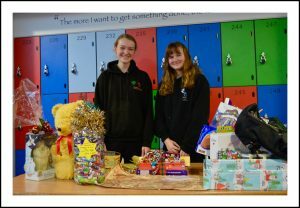 Year 11 Charity Prefects Jasmine (left) and Kate display raffle prizes during Charity Week. And Jasmine echoed the thoughts of Kate: “Seeing the whole school so motivated to raise money for our school charity was fantastic. Everybody played their part, and seeing all of the effort teachers put into their costumes on the last day of term was fantastic. “I really enjoyed running the different stalls and creating outfits for members of teachers to wear. The sense of achievement and enjoyment everyone got out of the fundraising was amazing,” Jasmine concluded. All of the staff at Penryn College would like to congratulate and thank all of the students for their incredible fundraising efforts throughout Charity Week. For more information on the services that Cornwall Air Ambulance provide, please click here.